“The emphasis on seeking ‘almost superhuman beings’ to lead schools deters people from applying for headships, a prominent education leader has warned,” this from The Times Educational Supplement (TES) recently. For Mr Rees, this raises a persistent worrying belief in, and a seeking of, ‘hero’ school leader-types, charismatic and dashing, champion stuff, flash-bang-wallop. It all might prompt at least one balding, middle-aged male in a Bradford school to look in the mirror, sigh longingly, and take another slow sip of his tea. Much has been written, debated, eschewed and rediscovered in the realms of leadership theory and practice in education. Most commentators agree that leadership has something to do with direction setting, although even this catch-all benchmark does not always stand up to close scrutiny. Most thought and literature on the topic identities with one of two camps: the first focuses on individual leaders; the second on organizational function. The former, characterised typically as ‘traditional’ theories of leadership, tend to flow from the ‘Great Man’ image as a historical point of origin. The ‘hero’ leader alluded to above is a close relative of the aforementioned ‘man’ and tends to emphasize the personal attributes or traits of the leader, going as far as suggesting that true leaders are born not made, a notion that has been durable across generations. That is not to say traditional theories have remained completely rigid. More recently, it has been recognised that certain individual traits of male and female ‘hero’ figures can give rise to a particular set of leadership behaviors in one setting, but are likely to be expressed differently in another, although the leader themselves is seen to remain largely unchanged across contexts. Since the mid-1960s a different school of thought, generally referred to as ‘contingency theory’, has dominated. It places emphasis on the interplay between the leader and the organisation and increased attention is directed, not towards the individual, but to the collective. Values consensus, shared vision, building the capacity of teams and distributed leadership all come to the surface in this more ‘modern’ understanding of leadership functions. Through this lens, leaders are seen to work within a dominant culture to achieve change. Symbiotically they shape and are shaped by the environment around them in order to be most effective. Conceived thus, leadership is less about a singular activity invested in an individual but rather shared responsibility distributed throughout an organisation. Students of leadership and organisational structure, in education and beyond, will perceive the crude nature of the analysis above, but it is not a million miles out. It is in this context of evolving theory and practice that we should place Mr Rees’ concerns. There is no ‘one size fits all’ person or methodology of leadership in education, or more generally, and studies that attempt to discern any measurable difference between cohorts of leaders and followers fail in that attempt, except to conclude that leaders chose to apply for positions of responsibility whilst others, for varied valid reasons, do not. Choice is the only difference. Leaders are not born and leadership is an open pathway to all who wish to develop themselves in this particular direction. That is not however the same as saying all will be successful in that pursuit given the finite nature of opportunities. Such is life. And so, to close, we go back to the detail in job adverts and specifications. Notwithstanding all of the above, I could not help but wonder if Bradford Grammar School has, in its use of language, been actively or unwittingly looking to recruit and encourage ‘hero’ leaders. When I applied to BGS for the Deputy Headship, the school was seeking to find someone who was “talented and dynamic”. The bar was set at “outstanding and inspirational” when the Headship came up. (It’s time to look in that mirror again!). 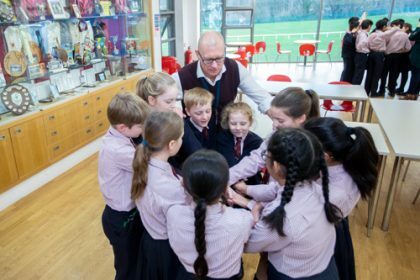 Most recently, when recruiting for our new Deputy Head we hoped to attract an “inspirational and innovative individual [with] personal warmth, empathy and pastoral skills aligned to a sound judgement and gravitas”. So, no pressure Mr Boardman! (I’m not worried. Quietly, knowingly, I believe we have found the person described in the ‘spec’). But are any of us archetype heroes – Head, Deputy Head, indeed any of our BGS support staff or teacher leaders? Does the badge fit? I would argue that words such as “dynamic”, “innovative”, “strong”, “inspirational”, “visionary” and “motivational” are not the exclusive province of leadership heroes, but rather behaviours that can be enacted by all kinds of leaders in different situations. I see no reason why a quietly capable and collaborative leader who incrementally tries to build consensus and shares responsibility cannot be characterised by any combination of the descriptors in the TES adverts that nettled Mr Rees. I am less worried about nomenclature than some, perhaps. Leadership opportunities should not be a closed shop and I suspect I’m not alone in being inspired by the examples of grounded, nerdy, flamboyant, modest, quirky, un-showy but ultimately effective leaders, each different to the next, who get the job done in a fashion that works for them, their schools and the equally diverse groups of children in their care. “Values consensus, shared vision, building the capacity of teams and distributed leadership all come to the surface in this more ‘modern’ understanding of leadership functions. Through this lens, leaders are seen to work within a dominant culture to achieve change. Symbiotically they shape and are shaped by the environment around them in order to be most effective.